Whether it’s in water, air, or even light, residents of Philadelphia are no stranger to pollution. However, a relatively new and pervasive form of pollution is impacting not just Philadelphia, but the entire developed world. This phenomena is known as electromagnetic pollution, and is much less visible than the murky coloring of the Schuylkill. Its impact, however, is equally significant. Electromagnetic pollution can originate from cellular phones, radios or any device that carries an electric current. Electric currents create electromagnetic waves, which have a tendency to interfere with each other; if left alone, this interference can cause electrical devices to malfunction. Luckily, a team of Drexel researchers led by Yury Gogotsi are seeking not only to contain these interfering waves, but to do it in the most efficient way possible — with two dimensional nanomaterials known as MXenes. Right now, electromagnetic interference from most devices is controlled using metal plates or brackets that cover certain components such as microchips. These plates are often made of aluminum, which contributes significantly to the weight and girth of the device. “As technology evolves, we need to get rid of them [the metal plates and brackets] to make smaller, flexible and lighter devices,” Babak Anasori, a researcher on the MXene team, explained in a digital correspondence. So the materials used currently to prevent electromagnetic pollution are, relatively speaking, clunky and inefficient. That begs the question: what exactly are MXenes, and how are they better than run-of-the-mill aluminum plates? “MXenes are a family of two dimensional transition metal carbides or nitrides,” Mohamed Alhabeb, a graduate student on the MXene team, explained via email. In simpler terms, not all MXenes are exactly the same. There are multiple existing varieties with different molecular formulas. Some of them consist of a transition metal bonded to carbon (transition metal carbides) while others are composed of a transition metal bonded to nitrogen (transition metal nitrides). The key behind the superior efficiency of the MXenes is their size. A single sheet of MXene is one nanometer thick. For reference, that’s roughly 100,000 times thinner than a piece of paper or a single strand of hair. It can also be coated onto any surface, making it more versatile than the traditional metal plates. “In a MXene paint or ink, there are billions and billions of individual 1-nanometer MXene flakes. When we spray or print MXene, 1000 to 10,000 or more MXene flakes lay over each other to make a MXene paper (again imagine putting sheet of papers over each other to make a bundle or book). MXene layered structure combined with its electrical conductivity leads to its best performance as electromagnetic shielding material,” Anasori continued. Essentially, multiple sheets of MXene stacked on top of each other facilitate shielding of electromagnetic waves while taking up very little physical space. “We can make sheets of MXenes with thickness of around one-tenth of regular paper that can outperform any known synthetic material in electromagnetic interference shielding,” Anasori claimed. In other words, MXenes are currently the best known nanomaterials in their class — no other substances have been engineered that shield electromagnetic waves as efficiently. So what was the inspiration for this unprecedented breakthrough? The answer is simpler than one might expect. In 2004, two researchers in the United Kingdom extracted from graphite a sheet of carbon that was one atom thick. Six years later, the pair received the Nobel Prize in physics for the impact their discovery had on the field of materials science. “Since then, scientists around the world synthesized new 2-D materials from layered materials,” Anasori explained. The meaning of the term “two dimensional materials” is not immediately obvious. In order to better understand them, it is easier to picture them on a larger scale. “Imagine a book as a 3-D material and each page as the 2-D material. 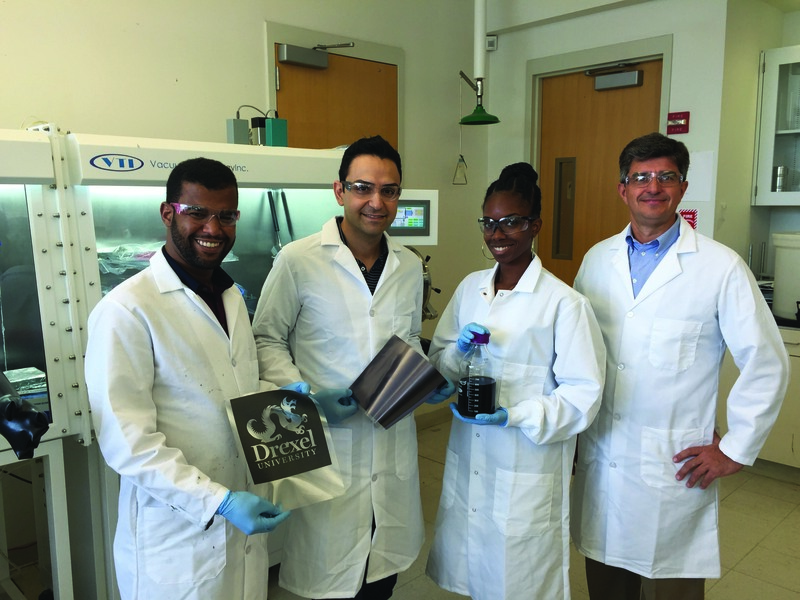 In graphite (book), there are layers of graphene weakly bonded together (sheets of paper), that we can separate by a simple Scotch tape, since the bonds between the sheets are weak,” Anasori said. In this analogy, single nanometer-thick sheets of MXene would be pages, and the book would be a series of MXenes stacked together to effectively block electromagnetic interference. But how did the research team get from graphene to MXene? The answer to that lies in a Drexel laboratory as well. “At Drexel, professor Michel Barsoum had been working on a family of layered ternary carbides and nitrides called MAX phases. In fact, MAX phases were rediscovered at Drexel, too, in Barsoum’s lab in 1996. In MAX phases, there are layers of strongly bonded metal carbides (covalent bond) which are separated by aluminum by weaker bonds (metallic),” Anasori explained. Barsoum and Gogotsi hypothesized that those metal carbide layers could be separated in the same way that graphene sheets could be separated from graphite. However, the metallic bonding in the metal carbides was much stronger than the Van der Waals forces present in graphene, so in that instance Scotch tape would not suffice. The pair of researchers resorted to a technique with a little more power. “To do so [separate the layers], MAX phase was put in an acid and the weakly bonded metal layer (aluminum) was selectively etched out, because it is more reactive than the strongly bonded metal carbide. This resulted in the synthesis of MXene,” Anasori explained. Anasori was one of several co-authors of the paper “Electromagnetic Interference with 2-D Transition Metal Carbides (MXenes),” which earned publication in the journal Science. The other co-authors were research leader Gogotsi, Alhabeb, Faisal Shahzad, Christine B. Hatter, Soon Man Hong and Chong Min Koo. Gogotsi compared earning the publication in Science, a prestigious scientific journal, to climbing Mt. Everest. “Even if you have been on the top of the world more than once, climbing it is a major challenge every time,” Gogotsi explained in an email correspondence. “When scientists author a paper in Science, this is an indication that they have done world-class research. Our students can be very proud of their achievement,” Gogotsi continued. Gogotsi emphasized that each team member was essential to earning this milestone publication, stressing the importance of collaboration. “This is one of the best examples of real teamwork, when all co-authors worked together contributing as much as everyone could to produce a great paper for the best science journal in the world. There are no secondary authors in this paper — all co-authors are key contributors,” he said. 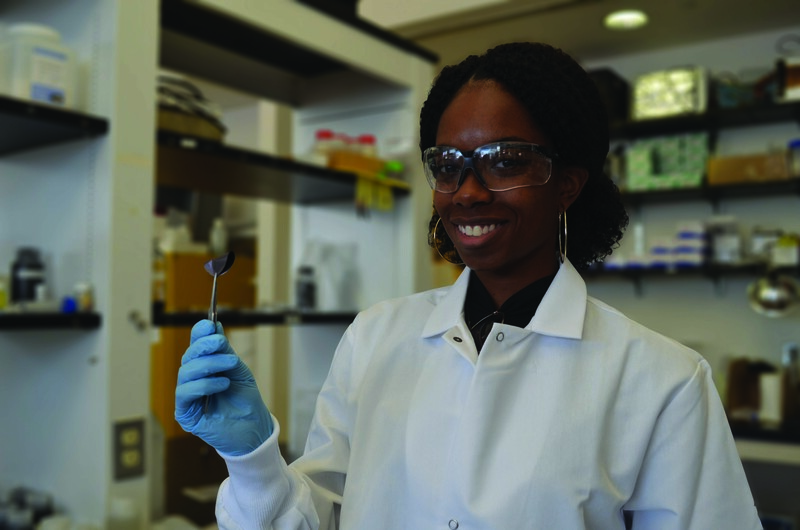 With publication in Science under their belts, the MXene team must determine the next step for their lauded nanomaterial. It is yet to be determined if and when MXene will be marketed and incorporated into products, but Anasori supposed that it may happen soon. “Currently we are working with a lab scale level, but at the same time we are working on large scale production [so] that companies can easily adapt the process,” Anasori stated. Gogotsi also shared his vision for the future applications of MXenes, agreeing that their usage could be widespread in coming technologies. “The finding of MXenes ability to provide excellent electromagnetic shielding may lead to use of these new materials in cell phones. We also hope that the ability of thinner-than-a-hair MXene films to reflect and absorb electromagnetic radiation will make MXenes a part of future miniature devices enabling the Internet of Things and Wearable Internet,” Gogotsi said. Whether or not MXenes will be implemented in future technologies is still yet to be seen. For now, Gogotsi and his team will continue to research this one-of-a-kind nanomaterial.